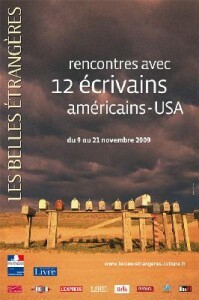 Here are two recent book reviews that will be featured at Les Belles Etrangères: Aux Etats-Unis in participation with Jeanette Franklin (director of the French American Center) this friday 20 November 2009 at médiathèque centrale d’Emile Zola at 7 pm. On page one I was involved. On page two I had a tear in my eye. On page three I was suddenly laughing out loud. Yes this is a great story and a real page-turner. From the start the detailed narrative fills your senses. You will smell the bacon frying, and other less agreeable odours! You will hear the sounds of the busy port, of saucepans clanging, of horse’s hooves and you’ll almost feel the sting of the whip. The well-chosen detail and beautiful descriptions make this a realistic experience, which is never boring. The wonderful insight into the workings of a child’s mind and his bittersweet observations make the main character memorable and very touching. The author has a fantastic imagination and the story is full of curiosities and tales, which lace the action with mystery and nuance. It is a great adventure story and the intrigue and plots within the plot make the novel a fast paced read. The historical context and detail makes this an instant journey back in time and I think this is an unforgettable novel, which I would recommend to all of you whatever your age. This is a sensitive and melancholy book, which transports us into a very interesting time and place. The delicate and poetic narrative tells a complex and moving story of love, war and society. I became quickly spellbound and was often caught off guard by numerous twist turns and surprises. The story of a marriage is the kind of book that you don’t forget. The ambiance it conjures up is quite haunting and the various events and characters I encountered have left a strong imprint on my mind. The backdrop to this novel, post war America, with its struggles for equality, racial tensions and threatening underlying atmosphere of witch hunting and war is fascinating. The author’s skill for attention to detail but not too much detail has the affect of humanizing the context and making history come alive. With subtle manipulation to the plot the author guides us with mounting suspense to make assumptions and then realise our errors. This keeps us turning the pages but also shows up our own pre-conceived ideas and involves us fully in an emotional journey. I found this novel touching, informative, quite thrilling at times and extremely memorable. I would recommend it highly. When you close the final page you feel that you have read a novel, which was neither written nor typed but rather painted with the delicate hand of an artist using only the finest brush and watercolours.